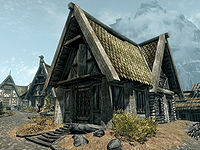 Houses in Skyrim are buildings in which you may sleep and safely store items in non-respawning containers. Several major cities have houses available for purchase of varying size, quality, and cost. There is no limit to how many homes you may own, only a limit on how many houses are available. If you get married, you have the option of having your spouse move in with you. Sleeping in your house provides the Well Rested bonus, a 10% boost to skill increases for 8 hours. Sleeping in your house with your spouse provides the Lover's Comfort bonus, a 15% boost to skill increases for 8 hours. It also rejuvenates your Health and Magicka. You will not gain any rested bonus if you have the Beast Blood effect from becoming a werewolf or have the Lover Stone activated. † Steward will take the player's full gold amount at the time of purchase, within the minimum and maximum price range. 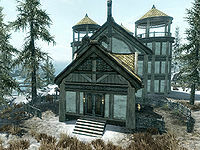 Located in Whiterun, right next to Warmaiden's and near the main gate, is Breezehome. The house has two stories, but is very small. However, Breezehome is the cheapest of all purchasable houses in the game and makes for an excellent starter home. The home's proximity to a blacksmith is very convenient for players who need Smithing amenities nearby. It features more storage space than Honeyside and Proudspire Manor, but doesn't have any mannequins. The house can be upgraded with an alchemy lab, but it is the only house that cannot contain an arcane enchanter. † Child's Bedroom only available if Hearthfire is installed. Choosing this upgrade will replace the Alchemy Laboratory. Honeyside is a two-story house located in the northwest corner of Riften. The house is small, but slightly larger than Breezehome. One unique feature is that it has access from both within the city, and from a dock outside the city walls. This makes Honeyside a useful home for players who wish to avoid loading screens or players who are vampires as the house can be entered without attracting any attention or even venturing into the city. Another unique feature of Honeyside is that it can be upgraded to have a large garden, with many harvestable plants. Coupled with the home's close proximity to Elgrim's Elixirs, this makes Honeyside an especially useful house for alchemists. However, the house has the least amount of storage of any of the properties. The house can be upgraded to feature an alchemy lab, arcane enchanter and a tanning rack. 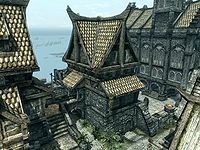 Vlindrel Hall is located high above Markarth, in the northeast corner of the city. The house is spacious and, like the rest of the city, features Dwemer architecture. It can be upgraded to contain harvestable plants, display cases, three weapon racks, one mannequin, an alchemy lab, and an arcane enchanter. It has the largest amount of bookshelf space of any purchasable home, which is great for displaying your collection of books. † The Child's Bedroom is only available if Hearthfire is installed. Choosing this upgrade will replace the Alchemy Lab and is repeatably reversible. In its most basic state, Hjerim features little more than a wardrobe, bed, and a chest. However the upgrades available for Hjerim make it arguably one of the most desirable house in the game, featuring the largest amount of storage space, a large armory with several display cases, plaques and mannequins, and a large amount of bookshelf space. Hjerim also features a secret chamber, which can be turned into an Alchemy and Enchanting room. You must complete Blood on the Ice before you can decorate Hjerim. † 8,000 gold minimum to purchase. However the steward will take your full gold amount at the time of purchase, up to 12,000. ‡ Bones and blood stains will remain, regardless of upgrades, until this is purchased. Purchasing the living room upgrade beforehand will remove this option for purchase (see Hjerim bugs). †† Child's Bedroom only available if Hearthfire is installed. Choosing this upgrade will create a new room in the hall outside of the hidden enchanting/alchemy room, making the entrance to the hidden room inside the children's room. Next to the Bards College in Solitude stands Proudspire Manor. Featuring three stories, it is by far the most expensive house in the game. The closest fast travel point is not Solitude itself but the Blue Palace. Despite its mammoth cost and grand design, the house is in many ways inferior to the other houses, featuring little storage space and no display cases. 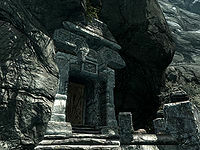 However, it is situated close to merchants and other important buildings in Solitude, and also comes with its own safe. There is an unusual gem in the Bedroom. † Child's Bedroom only available if Hearthfire is installed. Choosing this upgrade will create a new room next to the master bedroom. With the Hearthfire add-on, it is possible to construct and furnish your very own house. 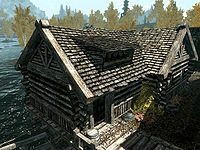 Three unique plots of land are available to build a house on throughout Skyrim, and the rooms of each house may be customized, with the houses potentially becoming larger than any of the city houses. Unique to the Hearthfire homes is that personal stewards may be recruited to serve each property, acquiring additional staff and furnishing the homes. Bards and private carriage drivers can also be hired. The purchase of land for the Hearthfire houses does not add to the "Houses Owned" number in the game statistics. The land for Heljarchen Hall lies north of Loreius Farm and west of Blizzard Rest. The land can be purchased from the Jarl of Dawnstar who resides in The White Hall. A unique aspect of this property is that you have the option of constructing a grain mill, allowing wheat to be converted into flour. South of Lake Ilinalta, between Falkreath and Riverwood lies the plot for Lakeview Manor. The land can be purchased from the steward at the Jarl's Longhouse in Falkreath. A unique aspect of this property is that you have the option of constructing an apiary, from which honeycombs and bees can be harvested. The potential location for Windstad Manor is between the Abandoned Shack and High Gate Ruins. The land can be purchased from the steward at Highmoon Hall in Morthal. A unique aspect of Windstad Manor is that a fish hatchery can be built to the north of the property, allowing you to breed and harvest varieties of fish. Severin Manor is located in Raven Rock, on Solstheim. Initially it is occupied by Mirri, Tilisu, and Vendil Severin. It can be later awarded to you by Councilor Morvayn as a quest reward for Served Cold. 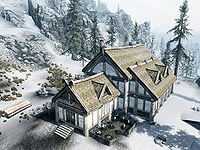 Severin Manor features a number of differences from other houses in the game; it is not possible for a spouse or adopted children to live here, it does not have a housecarl, and it does not have any available upgrades. However, Severin Manor does come complete with fully stocked enchanting, alchemy and armory areas. The house also boasts plentiful storage, as well as weapon plaques, display cases and mannequins. Joining a faction will usually confer the benefit of allowing use of their facilities, and many will offer a place to sleep and store items. Rising through the ranks of some factions will result in additional or improved lodgings, and becoming leader of the faction will bestow full command of their headquarters. Blades Sky Haven Temple The Reach Temple available upon completing Alduin's Wall, during the main quest. Not available if you side against the Blades over the Paarthurnax issue. College of Winterhold Hall of Attainment Winterhold Room available upon completing First Lessons, to join the College of Winterhold. Arch-Mage's Quarters Quarters available upon completing The Eye of Magnus, and becoming Arch-Mage. Companions Jorrvaskr Living Quarters Whiterun Bed available upon completing Take Up Arms, to join the Companions. Dark Brotherhood Dark Brotherhood Sanctuary Falkreath Hold Bed available after completing Sanctuary for the Dark Brotherhood or completing Destroy the Dark Brotherhood! Thieves Guild The Ragged Flagon Cistern Riften Bed and chest available upon completing Taking Care of Business, to join the Thieves Guild. Furniture upgraded after becoming Guildmaster. Nightingale Hall The Rift Hall available upon completing Darkness Returns, and joining the Nightingales. DawnguardDG Fort DawnguardDG Fort available after Bloodline if you reject Lord Harkon's gift, and side with the Dawnguard. Volkihar Vampire ClanDG Volkihar KeepDG Haafingar Keep available after Bloodline if you accept Lord Harkon's gift, and side with the Volkihar Vampire Clan. In addition, if you get married, certain NPC spouses have homes you can live, sleep and store items in. Please see the Marriage page for more details. Alchemist's Shack, near Ivarstead, has an end table that is safe for storage. It also has the benefit of an alchemy lab. Meeko's Shack, west-northwest of Morthal, has an end table that is safe for storage. The barrel and shelves respawn, however, regularly filling the house with junk. Riverside Shack, southwest of Windhelm along the White River, has one safe wardrobe and a bed. Abandoned Shack, east of Solitude, will remain accessible after you complete either of its associated quests. It contains an unowned bed, but no safe containers. Traitor's Post, east of Windhelm, has two wardrobes and a cupboard that you can store items in. The chest there respawns along with the bandits. Lund's Hut, north-northwest of Rorikstead, is a farm house with a non-functioning bed. Only the chest and end table are safe containers. 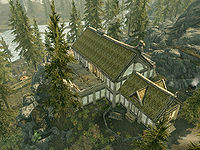 Anise's Cabin, southwest of Riverwood, can become a good early-game base of operations, although it is initially occupied. See the article for details. 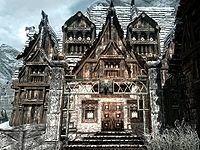 Abandoned House: The Abandoned House in Markarth can be lived in after killing the Vigilant in The House of Horrors, as it is set to never respawn, and therefore none of the containers automatically reset. There is a usable bed and 62 containers within the house. Cracked Tusk Keep: Every container in the Keep is safe, and once the bandits are killed, they never respawn. Helgen Inn: The ruined inn in Helgen features a wardrobe and an end table that can be used for storage, neither of which resets. The inn also features a perfectly preserved and functional bed. This makes for a very useful shelter at the beginning of the game, although the fort will spawn bandits if not visited for some time. Inns: While most inns do not provide any safe storage, their beds generally give the Well Rested bonus, same as an owned house, and if the innkeeper is befriended, then most inns have a bed that can be slept in for free. Sleeping Giant Inn: This inn is of special note, due to the alchemy lab, arcane enchanter, and two safe chests in the secret Blades room, which make this an excellent player home after you have gained access to it during A Blade in the Dark. Items placed manually throughout houses may have their location reset the next time you enter, generally being found where they were dropped from your inventory. If you want them to remain where you put them, there are several ways to make the game remember their exact placement. One workaround would be to drop items off your inventory you want to decorate your house with, then step outside your house, and reenter. Upon entering your house, every item you dropped will be safe to move, as their location will save. The weapon racks and bookshelves in Breezehome, Hjerim, Vlindrel Hall, and Proudspire Manor may not work. Items placed on weapon racks may become inaccessible, fall out, not display properly, or otherwise glitch. Placing items on mannequins may make that part of the mannequin become invisible. Mannequins may also "move" around the house. Giving or taking things from the mannequin will reset it to its normal position. When purchasing upgrades for the houses, the alchemy lab upgrade option will not disappear and will not be included in the house; the dialogue will remain indefinitely and will continue to be available for purchase. With Hearthfire installed, interior house zones (in particular, the child's bedroom) may have large gaps between textures, and entering these gaps may cause you to fall outside the playable area and respawn in a random house wing. ? Leaving and reentering the house will fix this. Esta página foi modificada pela última vez à(s) 23h12min de 11 de janeiro de 2016.